Unknown Origin can be sold at trading posts for a whopping $99,999 each. This makes selling the three pieces of Unknown Origin in the Secret Bases (that Psycho Bob doesn't need) a profitable undertaking -- nearly $300,000! There are some tricks to doing this. First, you'll need at least one extra Tac-Nuke. Also remember that if you unload Unknown Origin in your hangar, you won't be able to reload it. Follow the steps below to cash in on the extra Unknown Origin. Special thanks go to Luke and Nar Sluke for tips on how to get free Tac-Nukes and the value of Unknown Origin. You should already have the factions' Secret Bases targeted from a previous mission for Bob. If you lost them in your Buildings Menu, you should immediately retarget them before running the *New Mission* mission. Make sure you lock them in your Buildings Menu this time. Upon receiving the *New Mission* message from Psycho Bob, make sure you've got the Secret Bases locked into your Buildings Menu and that you're flying a Moth that fires Tac-Nukes. The Police Moth and Swallow will not fire the Tac-Nuke. Change Moths if you have to. My favorite for these missions is the Neo-Tiger because its speed insures a fast getaway. Now go to Psycho Bob's 1 and he'll tell you he needs you to get him some Unknown Origin out of one of the factions' Secret Bases. He'll equip you with a Super Drone capable of picking up Unknown Origin, and a Tac-Nuke that will blast open the Secret Base of your choice. If you "miss" the Secret Base with your original Tac-Nuke, Bob will fit you with another when you fly back to Psycho Bob's 1. This is an important key to getting a free Tac-Nuke to blast open both bases. Blast one of the bases, but do not retrieve any Unknown Origin. Now go back to Psycho Bob's empty handed and he'll give you another Tac-Nuke to blast the second base with. Luke has discovered that Psycho Bob will gladly outfit as many Moths as you'd like with Tac-Nukes. Pick a couple of your Moths you'd like to use to blast the Secret Bases. Fly the first to Psycho Bob's 1 when the *New Mission* message is received. Now go back to your hangar, switch Moths, and go back to Psycho Bob's 1 and he'll gladly fit the new Moth with a Tac-Nuke, too. He does not fit the second Moth with a Super Drone. You will need to use your originally fitted Moth to pick up the Unknown Origin. As a last recourse, you can supply a weapons dealer like Downtown Munitions or Dr. Jobe's with Fusion Parts and other goods and they'll build Tac-Nukes that you can buy. I like getting them for free from Psycho Bob. Regardless of when you get your Tac-Nukes, you cannot blast the bases until the *New Mission* message arrives. The game just won't let you blast them until then. After the message arrives, both Secret Bases are vulnerable to Tac-Nuke attack. Start by blasting the Klamp-G Secret Base in Riverside. It's the more difficult to enter, so we'll enter later on. Just blast it open and then return to Psycho Bob's 1 for a Tac-Nuke refitting. If you have two Moths outfitted with Tac-Nukes, use the one without the Super Drone (the second one fitted) to blast open the Klamp-G Secret Base. Now go back and get your Super Drone equipped Moth to attack the Laz Secret Base. Using the Moth outfitted with a Super Drone, Attack the Laz Secret Base. Enter it and pick up one and only one piece of Unknown Origin. If you pick up both, Bob will take both and you won't get to sell one. Go back to Psycho Bob's 1 with the single piece of Unknown Origin to complete the mission. You should have both Secret Bases blown open and both factions gunning for you. Get amnesty quickly by running the double amnesty strategy. I generally head straight toward Gamma from Downtown and kill the first Klamp Moth I see. Now I've got Laz amnesty. I use the Laz amnesty to go to Alpha and target some independent pirates who are Laz enemies. Then I kill a Laz Moth to get needed Klamp amnesty. I quickly kill the targeted pirate to regain my Laz amnesty and am in the clear with both factions. With amnesty all around. I can freely enter either Secret Base without any problems. They won't target you for entering their Secret Bases and stealing their Unknown Origin. The key to selling Unknown Origin is to not take it from a Secret Base until you have a Trading Post set up to buy it. It's not likely that any of the Trading Posts have $99,999 on hand. Thanks to Reaper we've discovered a workaround. His idea is to buy $99,999 or so from a Trading Post to make sure they have the cash for the Unknown Origin. The biggest problem with selling Unknown Origin is that you can only sell it to trading posts and the trading posts might not have the cash to afford it. Reaper has figured out a good way around this if you've got the cash. Reaper goes to a trading post and buys out all of their stock. This will almost always give them enough money to afford your Unknown Origin. The key is to make the sell immediately upon buying out the trading post. The goods purchased from the trading post can eventually be sold to specialty shops at a profit. I started by buying some goods at Resevoir Trading Post. It's a good idea to look for expensive items that resell for a profit. Weapons and Drones are good. Of course, you're going to have to have at least $100,000 banked to start this process. Resevoir Trading Post had three Laser Turrets and some Swarms -- really good. I bought them and then bought some Medium Pods to insure they had at least $80,000. Remember that they'll have some cash on hand, just not $99,999. I took the goods to my hangar in Riverside and unloaded them. Then I went back to the Laz Secret Base, snagged the remaining piece of Unknown Origin there, and sold it to Resevoir Trading Post. They had plenty of cash due to my previous purchases. I got my money back and still had all of the goods I'd purchased to sell at a profit. I sold the weapons to Klamp-G Weapons Shop. I'll discuss the Pods later. I repeated this process with Gamma Trading Post and one piece of Unknown Origin from the Klamp Secret Base. Worked like a charm. Again, I'd bought weapons that I could resell at a profit. I also got stuck buying some more Pods. You'll find it hard to sell Pods for a profit, but you won't lose any money and it's still worthwhile given the huge amount you're making off of the Unknown Origin. Finally, I repeated the process with Highrise Trading Post and the last piece of available Unknown Origin in the Klamp Secret Base. I wrapped things up by selling the stuff I'd bought from the Trading Posts. I ended up selling the Pods at a break even price at Trade Central. That's okay, I still made a profit on the weapons and Drones I sold as well as the whopping blag from the Unknown Origin. I figure I made about $325,000 from the whole deal which lasted a little under two Hardwar days. Selling UO to Trading Posts screws up their cash flow. They've just sunk $99,999 in something that they can't sell. That's right, they don't sell the Unknown Origin, just buy it -- go figure. Anyway, they'll be out of cash for some time. Don't use Trading Posts you use often. I use Trade Central and Alpha Trading Post the most, so I didn't involve them. 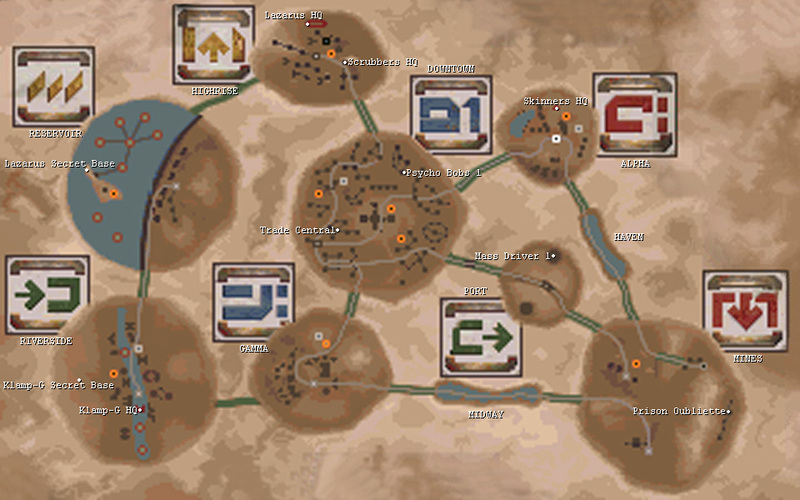 This means that you'll probably have to prepare three different Trading Posts. One for each piece of available Unknown Origin. Get a hangar in a convenient location beforehand. You'll need somewhere to unload the stuff you've bought before picking up a piece of UO. You will attract pirates. Be prepared with plenty of countermeasures. Don't buy items costing less than $3000 or so. You don't have the time or Pod space for a zillion small items. Stick to the big ticket items. When buying, get weapons, countermeasures, and Drones first. You can resell these at a profit after you've sold your Unknown Origin. You can sell weapons, Drones, and Flares to any weapons retailer like Psycho Bob or Klamp-G Weapons Shop. If you've bought out their weapons and you still need to get them some more cash, buy Pods. Pods won't resale for a profit, but they cost a lot and quickly build up the Trading Posts cash. Trade Central has a big appetite for Pods when it comes to selling. Keep up with the amount of money you've spent at a trading post. The best way to do this is to watch your bank balance. If you started buying with, say, $254,000, you need to buy enough stuff to reduce your balance to $154,000. This doesn't have to be exact. You can count on most Trading Posts to have at least $10 -20,000 on hand. So you don't have to buy a full $100,000's worth of goods. Once you've made your purchases, take them to your hangar, unload, and get a piece of Unknown Origin. Don't get sidetracked. You need to get and sell the Unknown Origin while the Trading Post still has your money. In the end you'll be over $300,000 ahead. The Trading Posts will recover from buying Unkown Origin and be normalized within a day or so.